Exploring Gingotts Bank will soon be one step closer to reality with the announcement of Warner Bros.’ latest Harry Potter studio tour expansion. From April 6, the iconic Wizarding Bank set will join The Making of Harry Potter experience at Leavesden Studios. 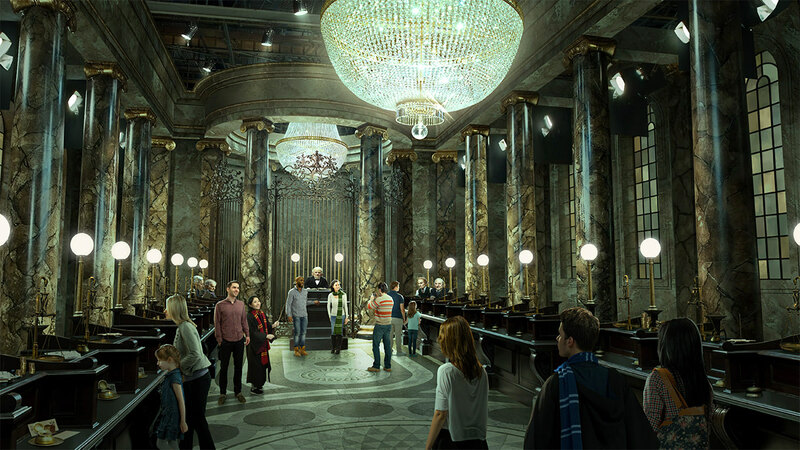 Concept art for the Gringotts Bank ‘Harry Potter’ studio tour expansion. Visitors will be able to tour the Gringotts main hall as well as enter the Lestrange vault where both the Sword of Gryffindor and Hufflepuff Cup props will be on display. The original Gringotts bank set is modelled on London’s iconic Australia House — in fact, scenes in the first ‘Potter’ film were shot here on location. During the events of Deathly Hallows: Part 2 the trio break into the Wizarding bank before destroying much of the main hall (thankfully reconstructed at Leavesden Studios this time) during their daring dragon escape. Tickets for the Harry Potter studio tour can be purchased from the official website.